While Deferred Action is Delayed, ICE Continues its Raids. 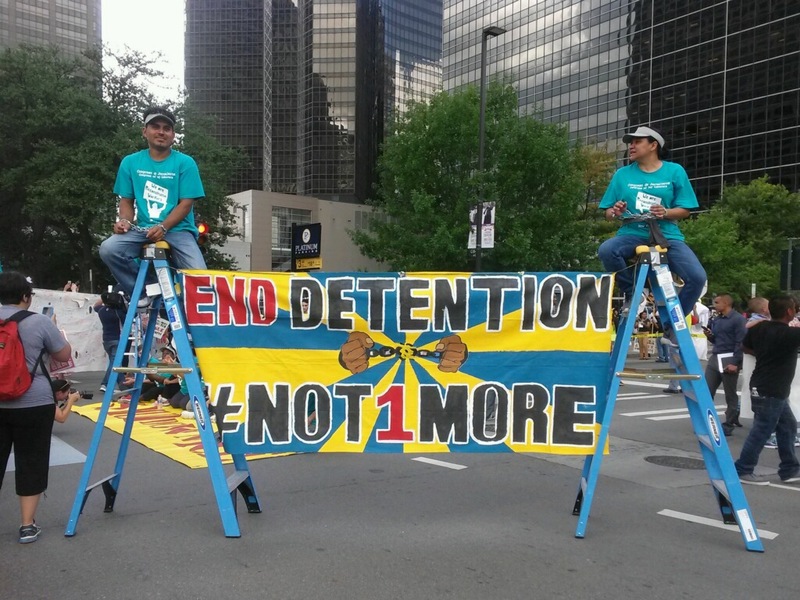 New Orleans Workers Take the Streets to Stop Deportation of Two Civil Rights Defenders. New Orleans, LA – More than a dozen undocumented immigrants are currently blocking the roads outside the federal New Orleans Immigration and Customs Enforcement (ICE) office to demand an end to the raids and unjust removals they say are continuing after the President’s executive action announcement even as the deportation relief program is enjoined in the courts. “When I wake up in the morning, I don’t think about what an appeals judge is doing,” explains Blanca Hernandez, one of the participants of today’s actions. “I worry about my husband being deported or whether ICE will show up at my door. The President and DHS have to do more to protect our families than just file appeals.” Blanca’s husband, Jose Adan Fugon-Cano is currently immigration custody and could face deportation as early as today. The members of the Congreso de Jornaleros started their act of peaceful civil disobedience after leading a march from the Fifth Circuit Court where an injunction appeal in the anti-immigrant lawsuit filed by Republican leaders from 26 states is being heard. “If ICE is going to be out in the streets than we will too. Our organizing is what won deferred action and we won’t stop until we have the relief and the respect that we deserve. We have the courage to do more, the President should too,” said Santos Canales, a Congreso member. Citing recent cases where ICE agents dragged the wife of immigrant worker WalterVallecillo from their home and threatened her children with the deportation of their mother and with foster care if they did not produce their father to be taken into custody; or where ICE is seeking to deport Gustavo Barahona and Jose Adan Fugon after their civil rights were violated in a false arrest and detention by local law enforcement, during which they were held without charge and transferred to immigration custody solely for standing in a public place, protest participants say the rogue agency has not stemmed its abuses and its deportations must be put to a stop.